This building was erected in 1915 as an hotel for the model village of Oakdale. It was converted into affordable housing in 2017. The village was designed on “the most modern lines” and situated in green fields, away from heavy industries. The aim was to provide better living conditions than were available at many other mining communities in South Wales. The Tredegar Iron & Coal Company spent about £100,000 on the village, initially to accommodate the 2,000 Oakdale Colliery workers and their families. The company didn’t want its model community sullied by drunkenness. In 1914 it argued that its proposed hotel would allow control over alcohol sales. Without the hotel, clubs would spring up and “the flagon trade” would thrive, the company said. Local chapels which supported the temperance movement opposed the hotel plan. The company said this was unkind – it had given free land for chapels to be built in Oakdale. The hotel was approved on the basis that the nearby Black Horse inn would give up its alcohol license. The hotel provided accommodation for visiting directors or guests of the company, which also held some of its board meetings here. A Miners’ Institute was built opposite the hotel in 1917. In 1989 it was dismantled and re-erected at St Fagans National Museum of History, near Cardiff. 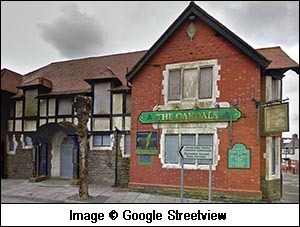 The photo, from Google Streetview, shows the Grade II-listed Oakdale Hotel in its derelict state in 2016, before nine new apartments and three three-bedroom houses were created here in a £1.7m refurbishment by Caerphilly County Borough Council, Pobl Group and the Welsh Government. The work was undertaken by local contractors M&J Cosgrove.